Image data obtained during the Cassini-Huygens mission enable the geomorphological analysis of valleys. Although Titan‘s valleys occupy only a small percentage of the surface, they can be found nearly at all latitudes (Langhans et al. 2012). 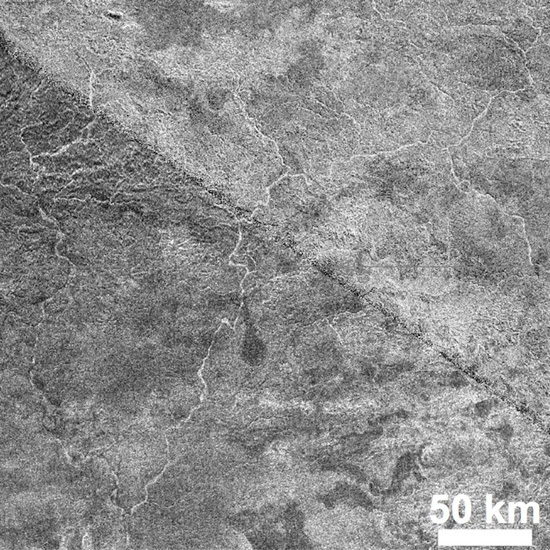 Image 1 shows a network of channels located close to Titan‘s north pole, imaged by Cassini Radar-SAR. The dark tone of the valleys in radar images indicate that they were likely filled with liquids at the time when the image was captured. The valleys in Image 1 end in one of several lakes, situated at high northern latitudes. Image 2 shows valley networks near Titan‘s equator. These valleys provide evidence of fluvial erosion in the past and they are most likely not filled with liquids today due to their bright tone in the radar image. Image 2: Dendritic valley network on Xanadu, captured by radar-SAR (T13, April 30, 2006, and T44, May 28, 2008). The image is centered at 138°W, 10°S. Flasar, F. M. (1983) Oceans on Titan? Science, 221, 55-57. Langhans, M. H. et al. (2012) Titan’s fluvial valleys: Morphology, distribution, and spectral properties. Planetary and Space Science, 60, 34-51. Lorenz, R. D. & Lunine, J. I. (2005) Titan’s surface before Cassini. Planetary and Space Science, 53, 557-576. Lorenz, R. D. et al. 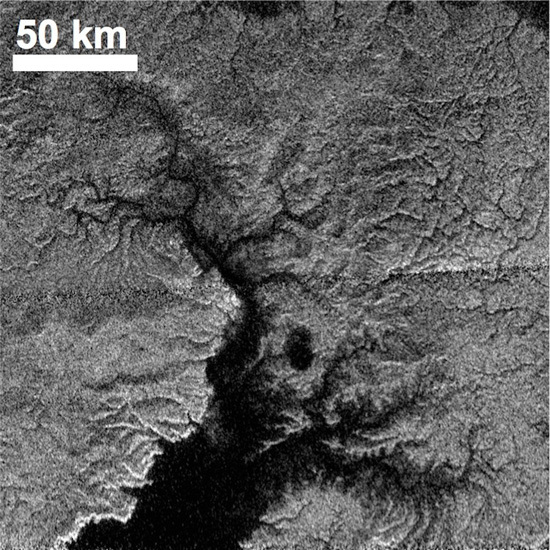 (2008) Fluvial channels on Titan: Initial Cassini RADAR observations. Planetary and Space Science, 56, 1132-1144. Perron, J. T. et al. (2006) Valley formation and methane precipitation rates on Titan. Journal of Geophysical Research (Planets), 111, E11001. Tomasko, M. G. et al. (2005) Rain, winds and haze during the Huygens probe’s descent to Titan’s surface. Nature, 438, 765-778.